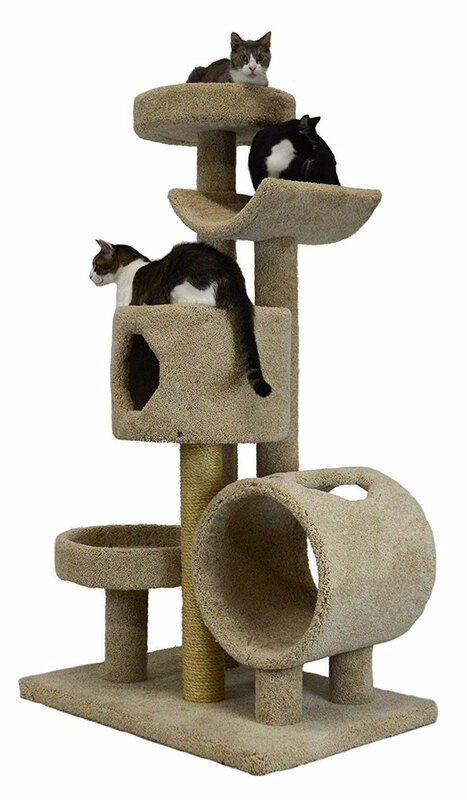 The Molly and Friends “Jungle Gym” is a premium handmade 5-tier cat tree. It features two beds, a cradle, a kitty condo, and a tunnel, as well as a tall scratching post that is wrapped in high quality carpet. This 5-tier tree is made from natural and solid ingredients like pine and sisal, right here in the USA. It measures 66 inches at its tallest point and 36 inches by 24 inches on its base. Its solid non-modular design uses construction staples and screws instead of glue, so carpet and rope stay right where they belong. The Molly and Friends “Jungle Gym” has received high praise and ratings from online consumers and users. The majority of people that reviewed the product were extremely pleased with its sturdy design and its quality components. A number of reviews noted that this pet tree came fully assembled. They opened the box it was shipped in and the cat tree was ready for the home. With minimal assembly and high quality components, it’s no wonder so many users gave it the highest possible rating. Many online users have also noted the price; some felt it was too high, and others felt it was less expensive than others they had looked at. When compared to major retailers’ store brands, the Molly and Friends “Jungle Gym” is competitively priced, but on the higher end of the price scale. Many of the users that complained about the price conceded that the “Jungle Gym” was deserving of its price due to its high quality. The only consistent complaint that consumers brought up, aside from cost, was the size of the cat beds. Many users felt that the beds could have been a little bit larger, noting that they didn’t feel their cats had enough room to be comfortable. Aside from this complaint, many users are incredibly happy with their Molly and Friends “Jungle Gym,” with this cat-tree receiving more five out of five-star ratings in online reviews than any other possible rating. 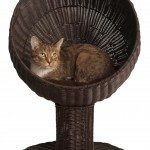 The Molly and Friends “Jungle Gym” is a fantastic way to pamper your cat. Its rugged, yet elegant design means it will look wonderful while it withstands the abuse caused by your kitty’s daily hi-jinx. This treehouse is crafted from high quality natural materials, such as solid pine and sisal rope, and it’s made right here in the USA. This cat tree is for people that love their pets and understand that spending a little extra means they will get a high quality product. Their pets will love it, and it will last for many years.